YY-CHR is a sprite ripper made by YY. If you want to rip games before the DS era, it is highly recommended, especially for NES games. While it is easier to rip from than Tile Molester, it is more limited on what systems it can rip from. A screenshot of YY-CHR, with a ROM of Super Mario Bros. loaded. When a ROM is opened, it displays on the left side of the screen a field of 128 tiles known as the CHR bank. To the right is a zoomed-in view showing the tiles currently selected in a higher size for visibility (which can be edited using the tools on the far right of the window). This zoom can be changed from a 1x (or no) zoom to a full 16x zoom. Using the right mouse button and dragging along the CHR viewer creates a cyan box that can be stretched out to cover as many tiles as desired. Left clicking returns to the standard white box. Using the traditional Cut, Copy, and Paste commands, highlighted tiles can be exported and imported into Microsoft Paint and other programs for use in creating a sprite sheet or for other projects (however, there are exceptions such as Paint.Net, in which case the tiles must be re-copied in Microsoft Paint and then pasted into the preferred program). By default, YY-CHR displays the CHR bank in a monochrome (for 8-bit games) or semi-monochrome (for 16-bit games) palette, tied to the "#BPP" settings below the CHR viewer. These default to what system the ROM loaded in is for, but in rare cases they must be set manually, such as in the case for original MSX games, which use 1BPP). Below the BPP setting is a dropdown containing different view arrangement options, helpful for games that align sprites and tiles horizontally across the CHR banks. 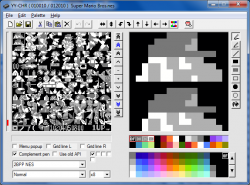 Underneath the zoomed-in view on the bottom right is a color palette, used to change the two, four, or sixteen colors used in the sprites/tiles. The button above the zoomed-in view which depicts a Famicom with a small white arrow is a palette importer- by reading save states from different emulators, it can load in the current palettes loaded in at the time the save state was snapped, making it easier to get the proper colors for sprites and not resort to guessing them by hand. This, however, only works with save states recorded from certain emulators. Many games, especially newer games released late into a system's life have compression graphics and as a result, these can not be ripped unless the game or emulator has a built-in decompression tool. In terms of success depends on the system and the game. While most NES games have all their sprites displayed, some games on some systems vary as in that you can rip the main character or a few sprites, everything if you are lucky while others can not be ripped at all. Some sprites, like those on the Genesis can be stored in an unrippable way, requiring other programs specifically tailored for the hardware the ROM runs on to view. Amstrad CPC - Not officially supported. The BIOS and some game fonts can be ripped from this system because most games have another way of displaying the sprites. Fonts use 1bpp 8x8 while Jet Set Willy (the only game that can be disk ripped) uses 1bpp 16x16. Neo Geo Pocket - Requires extra assembly work on the sprites. Sega Genesis - Many games are compressed or stored in an unrippable way, not officially supported. YY-CHR can also rip from savestates as well, but this does not apply to every game or system.